Response: The US not only has the highest health care costs in the world, we have the highest administrative costs in the world. If we can reduce non-value added costs like the ones we document, we can make substantial changes in the affordability of health care without having to resort to more draconian policy solutions. Our paper finds that administrative costs remain high, even after the adoption of electronic health records. Billing costs, for example, constituted 25.2% of professional revenue for ED departments and 14.5% of revenue for primary care visits. The other numbers are captured below. Response: The Office for the National Coordinator for Health IT suggested that the adoption of electronic health record systems would reduce administrative costs for physicians. In our study, we did not find that to be the case compared to studies published before the adoption of the certified EMR systems. Further, we found administrative staff often discussing how the EMR auto-populated fields in the EMR-we found that was not the case. Rather, the EMR was making physicians provide documentation beyond that required for clinical care to pre-populate the bills. 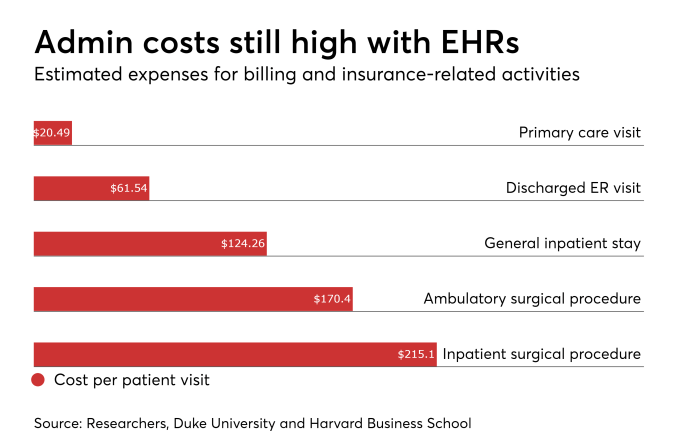 In other words, rather than de-skilling these tasks to lower-cost personnel, the system is burdening expensive physicians with these tasks – raising costs and potentially harming physician-patient interactions. Physicians are being asked to work harder every day-see more patients, do more paperwork. Yet, we rarely have the time or opportunity to ask why this is the case. Through this work, we can help understand some of the factors that are adding significant non-value added costs to the health care system. While there is little each of us as individuals can do to address this, we can advocate as a community for new approaches to reduce the administrative costs of health care. These savings can be available to lower health insurance premiums, improve clinical services, and/or increase take-home pay for physicians, so there is a reason to address this issue now. Response: We need to explore how to reduce administrative costs. The first step is to know how these costs are generated – this is the study’s primary achievement. Now, we should explore how to reduce them. That includes parsing the administrative costs we found and exploring solutions. One promising path is to look how other countries that have competitive health insurers keep their administrative costs much lower than the US. It’s worth emphasizing that this is a systemic problem. We found no evidence that is a problem unique to the billing organization we studied. There was no obvious waste in terms of duplication of systems or processes. Rather, we believe the issue is the structure of the insurance claims system in the US. Each insurance company negotiates individual agreements with each hospital and physician in their network (sometimes with separate agreements for each individual plan offered by the company). This cacophony of overlapping payment rules requires tremendous efforts on the part of providers to complete this simple task of submitting a bill for payment according to these individual payment rules. These tremendous costs are largely hidden from site, but directly contribute to the high health insurance premiums in the US. We should think very seriously about how we can change our regulatory and market structure so administrative costs can be reduced for all providers. Response: One response to our paper could be a call for a single-payer system to reduce these billing costs. We need to understand that countries with private, multi-payer systems like Switzerland have lower billing and administrative costs than we do in the US. Rather than adopt wholesale change of the payment system, we believe that we should advocate for wholesale change in the billing system. We documented these costs from the perspective of a provider organization-the insurance company likely has an equal set of costs on their side of the transaction. With all of the technology available to us today, we should be able to develop, validate and processes payments in health care as easily as we do credit-card payments in the consumer retail market. This would bring billing costs from the 3-25% we report to 2% that is closer to the current standard for merchants. This entry was posted in Author Interviews, Cost of Health Care, Duke, Electronic Records, JAMA and tagged cost of health care, EHR, electronic medical records, EMR by Marie Benz MD FAAD. Bookmark the permalink.